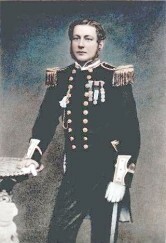 This website tells the dramatic and intriguing story of Lieutenant Edward St John Daniel (1837-1868), the first man, only officer, and only Royal Navy man to forfeit the Victoria Cross. Edward St John Daniel's life, career, exile, and untimely death, aged just 31, at Hokitika in New Zealand. The mystery of a photograph which apparently shows Edward St John Daniel in later life. This has led to the theory that Daniel may have returned to England from New Zealand, after switching identity with another man. This other man is possibly the one who died, and is buried, at Hokitika. The fate of Edward St John Daniel's Victoria Cross medal. Edward St John Daniel's family history. Latest developments, unanswered questions and areas of ongoing research. Explore Edward St John Daniel's story in detail by following the menu links at the top of the page.